Brief bit of good news off the back of my previous post. Jan Pronk, the UN’s representative in Sudan has been allowed to stay in Sudan…at least for a little while longer. 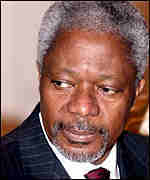 He flew back to New York at the start of the week and emerged, according to reports, with Kofi Annan’s full support. The Sudanese have said they still want him out (as a result of his excellent blog) but have given him until the end of the year to leave, on the understanding his deputy does most of the work. Comments Off on Pronk stays! It’s been known for blogs to get you into trouble. There was that office worker who bitched about her colleagues online, all very funny and all, until of course, her boss found out. And then that air hostess who posted saucy photos of herself aboard planes, and lost her job. This time it’s happened to Jan Pronk, the UN envoy in Sudan. On his blog, he’s been writing exceptionally detailed accounts of the work of the peacekeeping mission, and the frustrations of trying to get rebel groups and government officials round a table. In a mass meeting with them [rebel groups]- I counted about three hundred military commanders and political officials – they promised not to attack the Sudanese Armed Forces. They declared that they would defend themselves, if attacked, but promised to stop attacking. I demanded more: stop considering AMIS, the African Union Peace Keeping Force, as you enemy. Guarantee that bandits and rogue commanders no longer harass aid workers and steal their vehicles. The morale in the Government army in North Darfur has gone down. Some generals have been sacked; soldiers have refused to fight. The Government has responded by directing more troops and equipment from elsewhere to the region and by mobilizing Arab militia. This honesty, it seems, has backfired. He’s been ordered to leave by the Sudanese authorities, and by all accounts will fly out today. It’s a serious set back to the peacekeeping mission which seems (if Pronk’s accounts are accurate) to be making slow but steady progress in the right direction. Apparently, his blog‘s unpopular with UN officials, who’ve wanted him to stop writing for a long time. But I hope he doesn’t. What he’s produced is the most detailed eye witness account of poorly covered negotiations that exists. If it suceeds, the deal could become a blueprint for other nations, and writings like Jan Pronk’s will be vital to understanding it. It’s not the fault of Pronk or his blog that this has happened. It’s yet more evidence of the Sudanese military’s power within the country and their willingness to silence opposition. And meanwhile, reporters still in the country bring back more grim news.